Do I begin with how awesome our group of snorkelers were or how fantabulous the actual snorkeling was during our latest venture in Raja Ampat? I guess it doesn’t matter as we, once again, had a wonderful exploration of the many islands found off the Bird’s Head Peninsula of Indonesia. As is well known, this equatorial region is often referred to as the “heart of the Coral Triangle” due to its incredible marine biodiversity – perhaps the greatest on Earth. Each of CTA’s trips through Raja Ampat aims to expose our guests to not only spectacular coral reefs but also other types of healthy marine habitats and this particular trip brought us to blue water mangroves, seagrass meadows, and various reef types that flourish throughout the islands. Our first itinerary of 2018 brought us from Sorong to the island of Batanta and then northwards along the western edge of Raja Ampat’s largest island, Waigeo. We subsequently sailed over the equator to the stunningly beautiful limestone islands of Wayag eventually turning southward, towards the Dampier Strait where swift water flow attracts massive schools of fish. The first half of any trip through Raja Ampat is often overwhelming in terms of how many species are found in the shallow water habitats. But once snorkelers get a handle on the area’s ‘usual suspects’ of innumerable nudibranchs, cuttlefish, butterflyfish, angelfish, parrotfish, wrasse, etc., they begin noticing the more unusual species. A few remarkable animals we encountered included Solar-powered nudibranchs, Pygmy cuttlefish, Pewter angelfish, juvenile Six-banded angelfish and juvenile Regal angelfish, an ultra-rare Marble-mouth frogfish, and one of my favorites – a juvenile Pinnate batfish. As is par for the course in Raja Ampat, we came across a well-camouflaged Tasseled wobbegong and another carpet shark, what I believe was a Japanese wobbegong. Our group also had the opportunity to get close encounters with Hawksbill turtles and watch eight majestic manta rays being cleaned on a shallow reef-ridge. 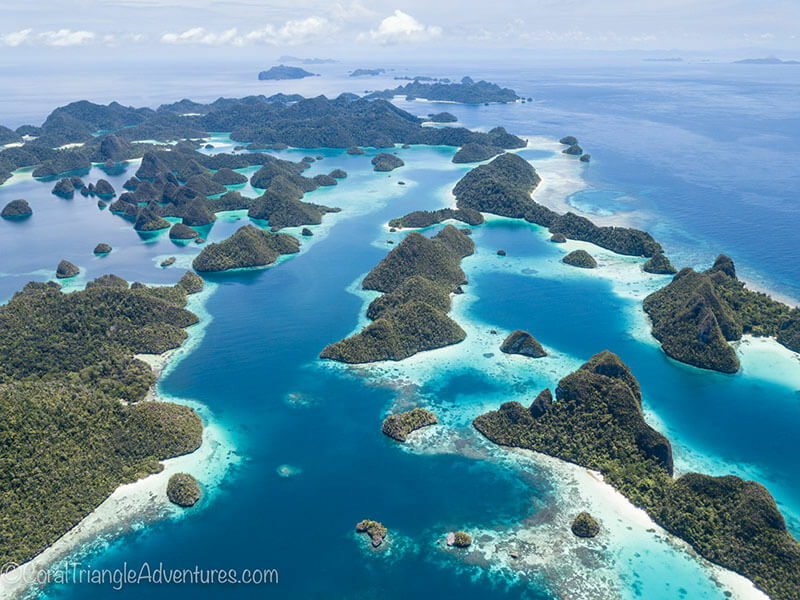 Each time Coral Triangle Adventures runs a trip to Raja Ampat I am reminded of how special and unique this remote region truly is. Although the region is now in the public eye and is well known for its extraordinary amount of tropical marine life it still retains its magic and mystery of how it has become the home for so many colorful and bizarre organisms. 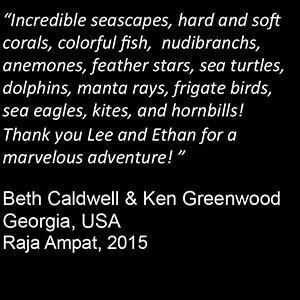 We visit Raja Ampat again in Jan 2019!